Hurricane Matthew hit southern Haiti as a category 4 storm on Oct. 3 and 4, 2016. The 145 mph winds, 24+ inches of rain and 15 ft. storm surge came ashore near Les Anglais. 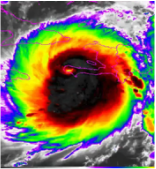 This is the worst storm to hit Haiti directly since Hurricane Cleo in 1964. Tremendous damage was caused to homes, churches, and schools. All crops have been lost, 80% of animals were killed, and most of the trees and vegetation have been lost. The 100 year flood hit southern Haiti just 2 weeks later, 20 miles on either side of Cayes, on Oct. 21, 2016. The flood waters from this flood were much higher than the waters of Hurricane Matthew. This, in and of itself, was a catastrophic event resulting in the loss of what little was left after the hurricane. It has made the need for help even more urgent. It is a dire and bleak situation, but God has RMI uniquely positioned right in the middle of it. And we are responding. RMI is now heavily involved in providing relief aid. When the hurricane struck we had 820,000 meals onsite and are now in the process of distributing these meals as safety allows. By faith, we have ordered 5 more containers of food to be able to distribute in the long term. RMI is also distributing several hundred water filters and water purification tablets as we have the funding. Please help us with the funding of these items so we can get them to those who so desperately need it. Donate now! RMI continues recovery aid, but is now addressing the need to rebuild with Rebuild and Restore teams. We are scheduling these work teams to rebuild churches, schools and parsonages. We have lots of opportunity for work teams starting in January through June. Should you want to put a work team together or join a work team, go to the Rebuild and Restore page. We need churches and individuals that will fund the materials that are needed to rebuild. This is currently one of our greatest needs. Please help us financially with our rebuilding efforts. News updates will be posted here as they come in. Scroll down to see earlier posts. There's a saying that goes "no news is good news". But that doesn't necessarily apply to our ministries in Haiti. Not when the recent 100 year flood results in the flooding of the generators that run the cell towers (you know, the ones that are barely limping along since the hurricane). After not hearing anything for a couple of days we did finally hear that the "no news" was due to the fact that there was no cell service. Things seem to be restored but the news that we've gotten in not "good news". Joel and Laura Sutton have flown to the US to be with Laura's mother. Laura shared, "My mom, Lettie Bond, is in the hospital following several heart events. She is not doing well and has a lot of pain. Please pray for her, my sister and her family." "On Thursday morning, Vonel, one of RMI’s mechanics was in a motorcycle accident while doing some work for RMI. From what we have been told, there was a man carrying a plank on the road ahead of Vonel and when he heard Vonel’s motorcycle approaching, he turned to see what was coming behind him. As he did this, it did not occur to him that the plank would follow his turn. Although, Vonel was able to swerve and miss hitting the plank completely, it caught and broke his upper arm. Amazingly, in spite of the pain in his arm, Vonel was able to steer his cycle with his one good arm and come to a safe stop without hurting himself or anyone else. That is a praise. Last that we heard, Vonel was at the hospital and was likely waiting for surgery on Monday when American orthopedic surgeons will be available. In addition to this crisis in Vonel’s life, his home was badly damaged, or destroyed in the hurricane and requires a lot of work. His father has also been sick and fell down the hill by his house the night before Vonel’s accident and had moved to Vonel's house for more help. Then, Thursday afternoon, our housekeeper, Emilye, shared that her mother’s health is declining in addition to the loss of her home which is in an area that was much harder hit by the hurricane than we were here in Les Cayes. Emilye had planned to leave Friday morning to visit her mother, however, while she was at church Thursday evening her seven year old daughter, Mikensia, was playing with a small kerosene lamp at home. Unfortunately, Mikensia’s clothes caught fire and she was rushed to the hospital with second degree burns to her left arm, side, abdomen, pelvic area, and upper left leg. Needless to say, Emilye’s trip to see her mother has been put on hold until Mikensia is doing better. It appears that she will be hospitalized for a while." Pray for our staff and our ministries. Things are going to be tough for a long time. Pray that the staff will not weary in their well-doing (Gal. 6:9). 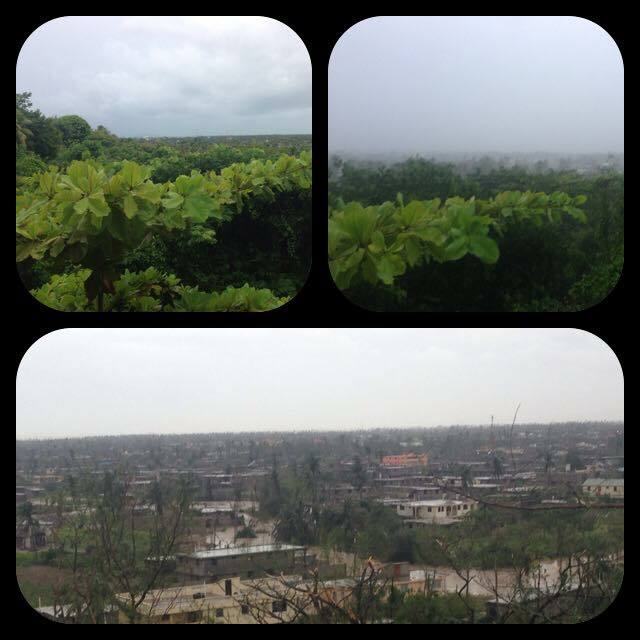 On Friday, Oct. 22, Haiti experienced what is being called a 100 year flood. October is typically the rainy season and indeed, it had been raining most afternoons since the Oct. 3-4 hurricane. But this was anything but typical. It began raining Thursday night, Oct. 21. It was a wide spread system that produced tropical downpours, with frequent thunder and lighting for more than 14 hours straight. The main area affected was 20 miles on either side of Cayes, where RMI’s headquarters is located. [The mission center and our facilities are located on a hill top and were not flooded, but several of our staffs’ homes were affected.] As Friday dawned, it was clear that creeks and streams had become raging torrents and had overflowed their banks, flooding fields, homes, businesses, churches, school and towns. The waters flowed freely over bridges and roads. RMI President, Dan Shoemaker, was in Haiti to see things first hand, and meet with and encourage our missionaries and staff there. He was to leave that day. They left for the Port-au-Prince airport at 5 a.m. but had to turn back within just a few minutes due to the high water overflowing the roads. They waited until 9:30 a.m. to try again. They made their way slowly through the flooded roads and mudslides and were finally able to get to the airport – too late to catch his flight to Miami – he was able to get a flight to Ft. Lauderdale and barely made that flight. You can see a part of Dan’s trip HERE. He said that he’d never seen that kind of flooding in all his 35+ years in Haiti. Many people had started to re-build their roofs and tried to clean up but much of what was left after the hurricane was taken or destroyed in the flood waters. The loss of animals, foundations of homes, stored food, personal belongings, vehicles and even actual land that was washed away is staggering. This flood, in and of itself, was catastrophic. Add it on top of the devastation of Hurricane Matthew and it only magnifies the need for aid: food, roofs, water filters, rebuilding homes, churches and schools to name just a few. Pray for Haiti. Pray for RMI as our staff continue to respond to the many needs around them and to the needs of our churches. It's been a traumatic 2.5 weeks since Hurricane Matthew decimated southern Haiti. It's like a war zone. Matchsticks are all that's left of the vegetation. And the human suffering and misery are only beginning. So today we want to share positive things that we see, hear and are experiencing - because God knows what is going on there and He is at work. This was shared by one of our Partnership Facilitators, Perguens Hyppolite, who is also a vet tech. "I have just finished taking care of these goats for this man. He said : "these are the only thing that hurricane Matthew left for us. Thank you Lord for saving them for me. "Haiti will need a lot of goats to replace the lost ones. Please keep praying for our dear Haiti." This afternoon's good news comes from Les Irois, a village on the far western tip of the southern peninsula - an area especially hard hit by the hurricane. "We just got off the phone with Pastor Jean Sainprival in Les Irois. He tells us that by God's grace, even with all the destruction in the area, the solar system, right through the hurricane, continues to work perfectly well. It is currently THE charging station for the community, cell phones, laptops, tablets, portable lamps, flashlights and so on. God is good! Your investment is having a great impact!" This system was installed in May 2015 (the picture is of the installation at that time). "Arrived in Les Cayes, Haiti about 3:30 this afternoon after a 2 hour stop for a demonstration that wouldn't let anyone through until the police finally showed up. Yup, back in Haiti! Everything seemed normal as we drove along except that there was evidence of tremendous flooding all along the road, but not much wind damage until about 20 miles east of Les Cayes. Then you began to see evidence that just built up and up the closer we got to Les Cayes. By the time we arrived in the Les Cayes area, I was heart broken as I saw so much destruction around me. Much of the mess has been cleaned up, but the massive destruction of trees and vegetation is astonishing. I am told that this is nothing, wait till you go farther west which we will be doing on Thursday. My staff were glad to see me and that I had come to partner with them in their pain. I know that they are still going through a lot with many of them having lost part of their homes and all have family that have lost their homes. The missionaries are doing very well under the circumstances. They are tired, and "Taxed" was a good word we decided together. They have gone through a lot in the last 2 weeks. They and our Haitian staff have done a great job in putting the ministry facilities back together and moving ahead. Looking forward to giving them an encouraging word in devotions tomorrow as well as to all that the day holds." Assessment reports are coming in. Some areas are still impossible to get to, though. Please note that when a report says that a roof has been damaged or destroyed, you can assume that the contents of that structure either/or got wet and were a total loss. *Pictures are availabe for these churches. Follow the link at the end of the report. Happening now....we were able to have a video conference between the Haiti staff and missionaries, Rob in NJ and Dan and Kim here in the Florida office this morning. It was amazing to get that much internet since access has been so limited (and will continue to be for a while).They had a good time of catching up to date on how everyone was holding up, what they were currently involved in as well as planning for the future. They are distributing food aid and relief supplies as best as they can. Fuel can be bought in Cayes, but is scarce or non-existent in the remote locations they need to get to so their trips are limited to where they can go on one tank of gas. Organizing rebuilding teams was also discussed since so many churches, parsonages and schools have either lost their roofs or been completely destroyed. We know that as reports come in, the next question that our C3 Partners will be asking is, "how soon can we come in to help with our partner church's reconstruction?" We're excited that the big organizations are finally arriving, including the US military as well as 500 trucks filled with supplies and aid coming from the Dominican Republic to the areas west of Cayes. Cholera is becoming a serious issue since so many of the wells, springs, and rivers have become contaminated. ​Many have said that this catastrophe is worse than the earthquake. The long term effect is not confined to southern Haiti, but for the entire country. The south was the breadbasket of Haiti. It provided so much of Haiti's food...staple vegetables, rice, fruit and much more. This has ALL, as in 100%, been wiped out. Some crops had just been harvested - those are gone. Some were to be harvested in December - those are gone. Large trees like mango and breadfruit are gone or severely damaged and those, in particular, will take many years to come back and begin to produce again. 80% of livestock is gone. Some say that 90% of homes in the entire peninsula have been destroyed and those that weren't were damaged. Businesses were destroyed and the jobs that go with them. The places that people gathered to worship and go to school were destroyed. It's utter and complete devastation -- for millions of people in the western portion of Haiti. It's hard to wrap our minds around it. The Haitian people are resilient. They've been through many disasters and suffer an incredible amount on a daily basis. For the Christians, their hope is in the Lord. God has placed RMI and its staff in a unique position to help in multiple ways and we are going to do our best to meet as many needs as possible. Please give what you can! Oct. 10, 2016 2:00 p.m.
A lot was accomplished over the weekend and our team worked tirelessly. The water systems on the mission center have been restored. One missionary stated this morning, "...it is starting to feel more like home even without power. Just having water has really improved our living situation so much!" The team did take a much needed day of rest on Sunday and enjoyed some down time together. Many more trees, debris and electric lines have been cleared making the roads passable in the Cayes area and the road from Port-au-Prince to Cayes is open. The rivers are going down, so vehicles are able to get through them where the bridges are down. We hear that the road west from Cayes to the town of Les Anglais has been opened up. This is fantastic news and means we should be able to get reliable reports and pictures on the churches along that road. What we hear from areas like Port Salut, and Les Anglais are indeed dire. Lives, crops, homes and livestock has been lost. Hunger is a dire need and people are desperate for any help. We sent out a truck this morning with 172,000 meals to distribute meals in the west, but it had to turn back due to insecurity along the road. Our staff are looking at options and ways to safely deliver food to our churches and areas that are in the most need. Since we are one of the only organizations who already have food on the ground and in place, a number of NGO's have contacted us to partner together to distribute food in the south. A note to Hope for Kidz sponsors...right now we are not able to check up on individual children. In one sense, we have to proceed with the adage of "no news is good news". We know you are concerned for your sponsored child and so are we, however, the circumstances are so extreme, we haven't been able to get to all of the churches and schools to check up on them. Keep checking this website for updates. And keep praying for their safety and provision for their families. We know it is very difficult for many of you who have been to Haiti and have left a piece of your heart there to wait for news of your loved ones at your Sister Church. Please know we are doing our utmost to get accurate reports and pictures for you. Since the cell phone system has been severely damaged, we've not been able to get in touch with the churches and pastors. Our Partnership Facilitators are hitting the road to visit each of their assigned churches to check on the church buildings, the schools, parsonages and communities. Once they make those reports, we'll post them - so keep an eye on this website and Facebook as well. At this point we are not collecting relief supplies here in the states. That may come at a later date and may involve construction supplies more than clothing and toys. Our priority right now is to help with the overwhelming food need. Hunger is what they are facing now, even as they begin cleanup and work to rebuild their lives. This is where we can help. And it is where YOU can help. By faith we've ordered 5 additional containers of food. This morning already we've heard of one of them being paid for completely by one church in Ohio! One small church in Nebraska raised $13,000 all by itself! And one Sunday School class at a local church raised $1,200 in a special offering. God is touching people's hearts and starting to bring in some funds. We are so grateful for this incredible response. We need your help now. Every little bit helps. Please share this web page and/or RMI's website with your friends! Get your colleagues at work involved in helping. Spread the word. Give today! We got the limb off Greg's house and pulled down the broken section of tin roof by the office. We began cleaning out water from the RMI office. Continued to move Christiansens into another home (a missionary who's on furlough, so it's unoccupied right now) and help them unpack. They are not moved in yet. Removed a tree from their new house and patched roof. Put solar panels back on Yordy's home and guesthouse. Jerry-rigged a pole to use as makeshift antennae and reprogrammed the satellite dish for internet. Worked on the getting the water lines fixed. Scott dig a hole for the powerline pole, went to lunch, and the Haitians filled it all back in :). Courtney is back in the Thompson's house. Met with Benson and Benjamin to formulate a game plan on how to proceed with helping. We got the trees removed from our water lines feeding our house and the trees cut off the power line. Daniel said our inverted literally melted....The fan cover, the side, and some other parts. But, he thinks the batteries are still ok! PTL. Joel finished cutting all his trees and piling them up, got the tree off Tijean's roof and helped many others till he finally said no. Laura started putting their house back in order. The gate to the depot was to be fixed...but I did not actually see it on yet. I know a lot more was accomplished but these are the highlights. By the way... I am learning just how bright and hot the Haitian sun can be when you don't have any trees around your house. The report is not good. Camp Mahanaim has been badly damaged. High winds and water washed away everything that was exposed. All doors to buildings on the camp were ripped off and water flooded every room in every building, even rooms on the second floor. All of the solar panels were washed away and destroyed. All personal belongings have been destroyed. Flood waters in the area are still too high for any kind of motor traffic. Food that was stored for feeding programs was washed away. Rod, Debbie, and Katie are still unable to leave the mission compound in Cite Lumiere. Rod worked all day yesterday removing over 200 trees that are down and blocking the way to move more than 200 feet from where they staying. He said the main concern now is for the people of Les Cayes who have had everything they owned destroyed. Their houses have been washed away, there is no food or water available. They would appreciate your prayers too. Oct. 5, 2016 3:30 p.m.
As reports from the field continue to trickle in, it is beyond obvious that there is a major relief and rebuilding effort that must begin. As an organization that has been working for 30+ years all throughout the Southern Peninsula (South, Grand Anse, and Nippes regions), we, along with our deep national partners, are positioned well to have a great kingdom impact. We want to help. All of our efforts will be done in coordination with local and National leaders and under the authority of local churches. Our effort will be their effort. We will do this together. 1. Pray for God’s grace and care for His people. 3. Share this with as many people as you can. 4. Partner with us! If you are a part of a church or association that would like to partner with RMI in our relief efforts, please call us toll free at 877-764-5439 or email us at info@rmibridge.org. The RMI Team, National and American missionaries, our many church and school partners, our trucks, our equipment, our facilities and our hearts will be fully engaged. As we begin to dig ourselves out, we will quickly begin to do all that God has for us. We can't do this alone. We need you. -It isn't an exaggeration to say that near 100% crop loss is throughout Southern Haiti. The food needs of the people will be great. We have much food already pre-positioned in some of the most highly affected remote areas. This food will serve well, but millions of meals more will be needed. -The Mission Center, home to some of our missionaries and the RMI facilities is in need of repairs. All electric lines are down. Many trees need to be removed. Water systems need repair. Roofs are missing. Walls have crumbled. RMI Office office equipment has been lost. Gates are destroyed. The list goes on. -Many homes, churches, and schools in our local and partnership church communities have lost roofs, and or the structures themselves. -Many animals have been lost. Access to clean water has been dramatically reduced. -Our facilities, our trucks, our equipment and our people will all be fully engaged in the effort. Frankly, we need all the help we can get to do all we can to serve the Haitian people. Will you please join us by prayerfully and generously donating so that together we can honor the Lord? October 5, 2016 1:30 p.m.
We were able to have a long phone call with Lee Nunemaker this morning. All the missionaries are safe (RMI's and about 30 others from other organizations). The mission center has no water since the system's pipes were broken when trees fell over, roots and all, as well as there is no power. There's no electrical power. All the lines are down on the mission center and beyond and many of the poles are broken off. Six out of 18 missionary homes lost their roofs. The internet satellite antennae was ripped right out of the roof where it was stationed, taking a chunk of concrete with it so they don't have internet. Driveways and roads on the mission center are covered in debris and downed trees. Yesterday they spent the day just trying to dig out of their homes and carve out paths to get from one house to another to check on their neighbors and offices there on the mission center. All the missionaries are pulling together to take care of each other, and working on establishing some sort of water system, power, and shelter for those who lost their roofs. We have heard that Benjamin, Benson and most of the other staff have checked in. Some have damage to their homes, and one had a family member struck by flying tin and was being taken to the hospital. We received pictures of Rob Thompson's yard and property which is posted here in a slideshow format. We are thankful that his tin roof stayed on but were saddened to hear that the other side of their duplex lost the tin. So many trees are down that movement is almost impossible right now. Benson lives 10 minutes from the mission center but only today was able to find a way to get there. When asked how the roads were, his response, "There are no roads anymore, just trees on top of trees." What we've heard from Haitian nationals over and over is, "The country is finished. There's nothing left, it's no more." It is hard to wrap our heads around the complete and utter devastation that we are seeing and hearing about just around the Cayes area. We haven't been able to get through to any of our church partners but know that many villages are cut off. Roads and bridges are washed out. Crops and livestock are lost. Homes have been flattened and/or flooded. Latest Update... a few of our Haitian staff are safe at the RMI Depot (there are many more we haven't heard from). Our gate to the Depot is in the middle of the road. The metal roof over our mechanics shop is gone. Most metal roofs we put over our containers to protect them are gone. RMI Office in Haiti is intact. Some windows gone, water all over the floor, but structure in intact. Our missionary keeps saying.... Not good. October 4, 2016 10:30 a.m.
Keep praying for Haiti. The next 24 hours are critical. Hurricane Matthew is a slow moving storm which means it will have time to dump even more rain. It has already taken a toll on the southern coast. We've heard from the Les Anglais pastor who shared that at least 32 homes located on the beach have been lost. Reports from Dame Marie are that the roads are flooded and the village is cut off. Downtown Cayes is flooding. Storm surge is expected to be 10-15 feet. The Haitian Government has tried to encourage people to leave their homes for higher ground but it has no means to help them do that. Residents are unwilling to leave either because they have nowhere to go or because they want to stay to protect their belongings. RMI's staff and missionaries are secure in their homes. Continue to pray for their safety. ​October 2, 2016 - 4:22 p.m. Urgent prayers are needed for our Haitian church partners, our ministries, national staff and missionaries - and all of southern Haiti. Hurricane Matthew, currently a category 4 storm, has shifted slightly east, bringing the eye close, if not passing right over the tip of the southern peninsula. We have a number of churches that are right on the water and in that area....Tiburon, Aux Coteaux, Boyer, Les Irois, Dame Marie just to mention a few. Morency is on the beach, and Baraderes is near the water and where 3 rivers come together (the parsonage backs up to one of them) and floods frequently. Many other churches are in the mountains, where the estimated 15 to 40 inches of rain could bring life-threatening mud and landslides. You get the idea! We are very concerned how up to 150 mph winds will affect so many. 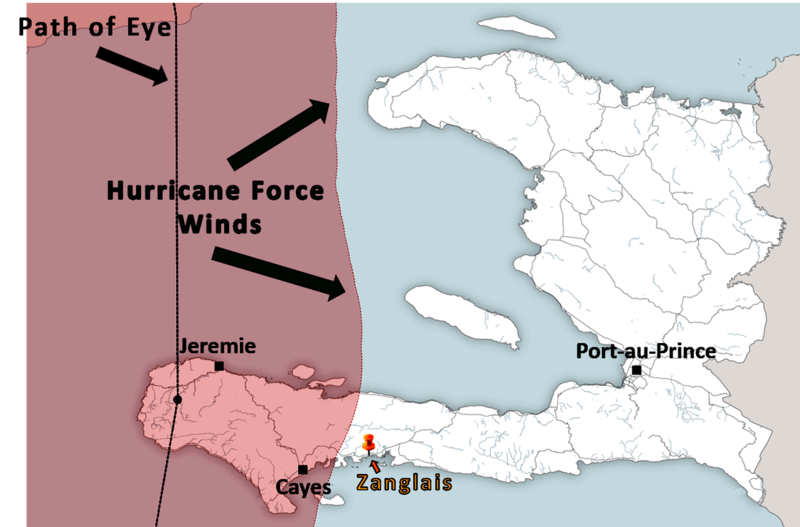 Haiti is ill-prepared to take such a serious hit. It will make the already existing extreme poverty even worse. Our real concern is if the eye of the storm keeps drifting to the east, it will be over more of Haiti and the destruction will be multiplied. It is said to be capable of dropping from 15 inches up to 40 inches of rain in many areas. This will cause awful flooding, mud slides, landslides, and raging rivers. Add the intense wind starting at 150 miles an hour near the eye and decreasing from there. However, so far this is a slow moving system which means the impact of the wind and rain will be multiplied. Crops are slated to be harvested in the next month. This will destroy most of the crops. Many animals will lose their lives, wiping out the savings account of those living in the country areas. There are so many ways this will impact most people in the south. Homes that have thatch or tin roofs will be destroyed or severely damaged. Many churches and schools will lose their roofs. The missionaries and staff have been preparing their homes, the RMI office, and other facilities. They have a good hurricane preparedness plan of action, which they are implementing. Most of them live in cement homes with cement roofs. Many of our staff do as well. For those who don't, they are invited to stay at homes that are secure. The Partnership Facilitators have already called the C3 Partner churches to let them know what to expect so they can prepare as much as they can and to let their people know about it. Once the storm is passed they'll be checking in with them to see how things went and what their needs are. As we have updates, we will forward them to you. We do have food aid ready to get to the areas of need once the roads are passable. The most effective help you can give is to sponsor food aid boxes for your area and church. If this is possible, please call the RMI office (239-368-8390) to let them know how many cases of food you would be able to help sponsor for your area. It would help us to know ASAP so that we can begin to make plans of how to help once the storm has passed. The food aid boxes of 216 meals are $25 a box. We are opening up our Thanksgiving Food Drive with reduced prices early, so the more you buy, the more you can send! You can also go to our website and donate for food boxes or to our general disaster relief fund from which will help meet needs other than food relief. These are pictures of Rob Thompson's yard. Before, during and after the hurricane. This picture was taken from the same spot each time. Cite Lumiere, the mission center that houses about 45 missionaries, as well RMI's Haiti Office and Depot yard. ​ and the extent of the hurricane force winds.